My first-ever fondue experience (yes, I went out to buy a fondue set just for this). Now I know why fondues are such fleeting trends: they are fun, great for parties or having people over, but boy do they get old fast. I could only see myself pulling out the fondue pot for special occasions, so it probably will be collecting dust in my cabinet. Anyway, this recipe was pretty good (you can't screw up chocolate TOO badly), but it had some major flaws. Because I'm new to fondue cooking, I decided to make the actual stuff in a pot first, and then transfer it to the cooker to keep warm and serve. I was amazed at how quickly the fondue pot heated up though, so I probably could have made it in there to begin with. Sweetened condensed milk and evaporated milk are cooked together and brought to a simmer, and then bittersweet chocolate, vanilla, and salt are added until melted. Flaw #1: The fondue was WAY TOO THICK. I looked through the fondue pot's enclosed recipe book, and interestingly enough, their recipe used a full 14-oz. can of sweetened condensed milk (instead of this recipe's 1/4 cup! What a difference!). So I'm sure that had a lot to do with its consistency. Even though it stayed heated through in the pot, it seemed to get thicker and thicker, to the point where I even added more evaporated milk. This worked a little, but not really. Flaw #2: Although the flavor was good, rich, and chocolatey, I think semisweet chocolate would have been better here. 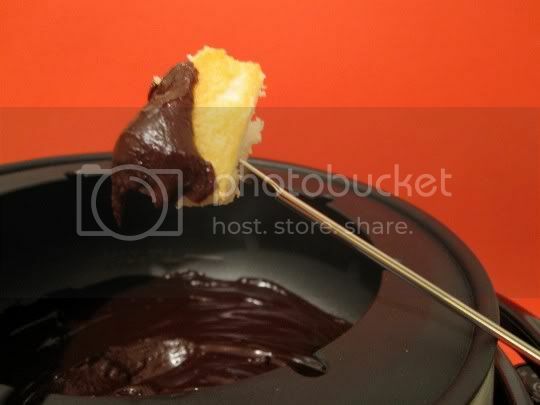 Not to say that the fondue didn't taste good or wasn't sweet, but the chocolate flavor was a bit overwhelming. I was looking for a more mild chocolate with rich creamy caramel...not so much. The flavor in general was interesting: sweet and chocolatey, but also slightly savory and salty. I served sliced strawberries, bananas, and angel food cake alongside this warm chocolate dip...and I think the angel food cake was my favorite! But I'd probably experiment with orange slices, marshmallows, pretzels, maybe even apples. Make again? This was a good first experience with fondue, but I'd probably try a different recipe...one that would achieve a better consistency.